Tada! Here it is; the long awaited Part Two that you have been eagerly awaiting since Part One. We had just left the Old House and High Town behind us, so let us see what is next. We pause for a moment of reflection at the War Memorial. It was erected in 1922, four years after the end of World War I. Such was the devastating loss of life during this conflict that just about every village has its own memorial. Sadly additions are still being engraved onto it, up to and including the most recent conflict in Afghanistan. The design is based upon the Eleanor Crosses. These were twelve monuments that Edward I had erected along the route taken by the body of his beloved wife, Elanor of Castile. She died in 1290 in Lincoln and it took twelve days to transport her body to Westminster Abbey in London. Wooden crosses were initially erected where her body rested for the night, later these were replaced by octagonal stone monuments, lavishly decorated. Only three of the original stone monuments exist. 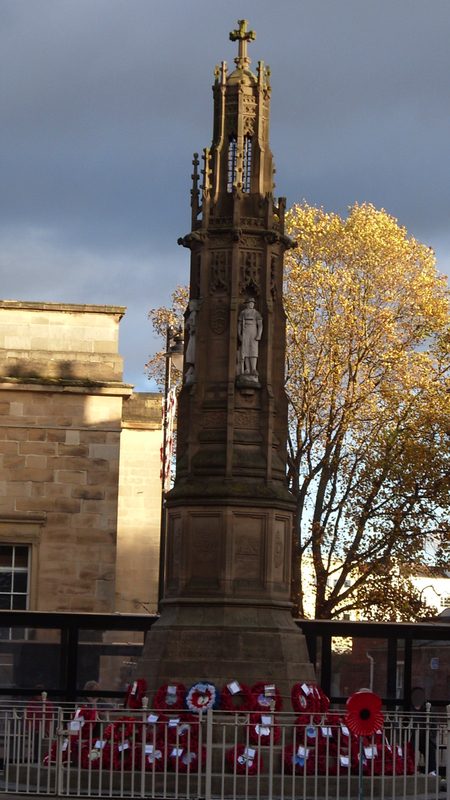 The design was much replicated, as is the case with the War Memorial in St Peter’s Square, Hereford. For the geologists out there, the steps of the War Memorial are made from Jurassic Pea Grit limestone brought up from the Cotswolds and they contain tiny fossilized crinoids. These are marine animals of the class Echinoderm, which also includes starfish. A little side street leads from St Peter’s Square to the cathedral. It is not particularly photogenic at the moment, being clad in scaffolding, but it has the most magnificent carvings which are currently being restored. It was originally built in 1079 and is dedicated to the Virgin Mary and St Ethelbert. King Ethelbert was beheaded by King Offa of Mercia in 792. Ethelbert’s tomb was situated where the cathedral was later built. Miracles were said to occur at his tomb and so he became a saint and a church was built on the site. This was later ransacked by the Welsh prince Gruffydd ap Llywelyn. The Norman bishops then took the place in hand and set about patching it up in 1079. They spent about 500 years getting it how they liked it. The decor includes misericords; mythical beasts and grotesque creatures carved in the choir stalls. I am sorry that I have no photos of the interior, but I was not inclined to make a “donation” to go inside. It became a little knocked about during the English Civil War, but remained largely intact. However, on Easter Monday 1786 the west tower collapsed. It wasn’t until 1841 that they got around to restoring it. 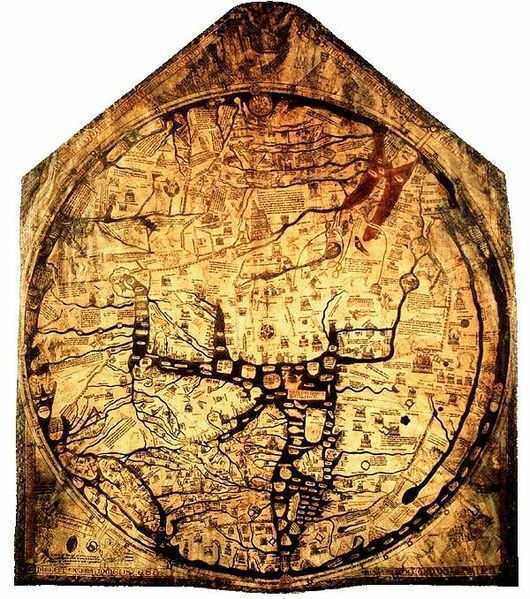 The cathedral is in possession of the famous Mappa Mundi, a 14th century map of the World. It is a religious rather than a geographical representation of the World, with Jerusalem at its centre. The cathedral also contains a rare example of a chained library. They did not trust monks to return their books on time! 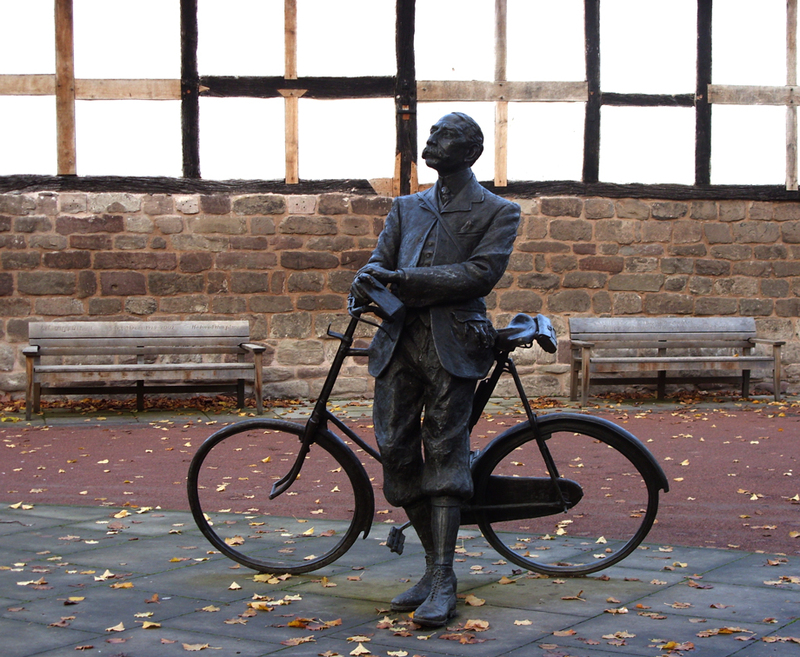 “Oi, no loitering!” Only joking, it is the esteemed composer Edward Elgar leaning on his bike admiring the cathedral. He seems a bit of a stiff chap, but then he did die in 1934. However, before departing he did write some bits of music for us all to enjoy; The Enigma Variations and Pomp and Circumstance probably being his most famous works. His bicycle by the way is called Mr Phoebus. He was born in Worcestershire, but lived for a while in Herefordshire. 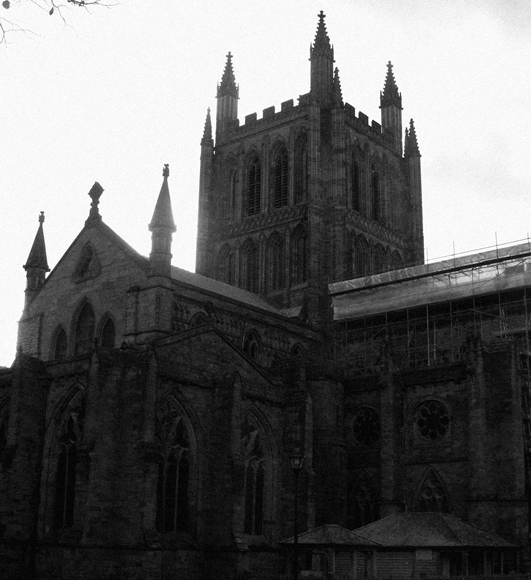 He is strongly associated with the Three Choirs Festival, held at Hereford Cathedral, which is not doubt why there is a sculpture of him, by Jemma Pearson, in its grounds. Oh dear, I am droning on so and I haven’t finished our walk yet. I fear the delights of Lord Nelson, some trees and a river view will have to wait until Part Three. 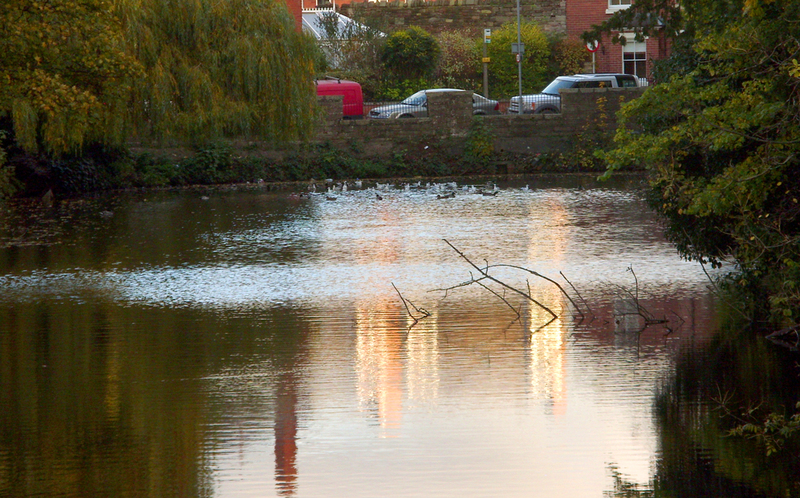 Oh go on then, to whet your appetite, or even to wet your appetite, here is a picture of the Duck Pond. Its proper title is the Castle Pool; yes Hereford used to have a castle and this used to be the moat. To find out what happened to it you will have to tune in for the next thrilling instalment. This entry was tagged Castle Pool, Edward Elgar, Eleanor Crosses, Ethelbert, Hereford Cathedral, Mappa Mundi, War Memorial. Bookmark the permalink.